Hello friends! 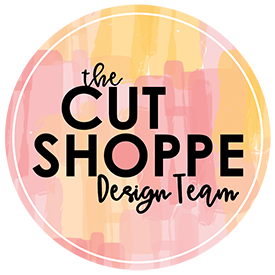 I have a new layout to share with you that was recently on The Cut Shoppe Blog. For my layout today I used two cut files from The Cut Shoppe Etsy Store. I used The Tree Farm Cut File and The ‘Tis the Season Cut File. In Cricut Design Space I used the contour feature to make one of the trees from The Tree Farm Cut File into a solid image. Then I took the ‘Tis the Season Cut File and sliced the ‘Tis the Season to Sparkle’ image through the tree. This will allow me to back the sentiment with pattern paper. Before I backed the cut file with pattern paper I added color to the tree that is cut on white cardstock using multiple mixed media products including oil pastels, Shimmerz Jeni B Bleu Vibez, and Shimmerz Don’t Citron Me Coloringz. The woodgrain background paper is from an older Hip Kit and all of the other pattern papers are from the Pretty Little Studio ‘Tinsel Town Collection’ designed by Ashley Horton. I also used multiple embellishments from that same line including the houses, the frame and the adorable Santa! I wanted to add a little more interest to the background so I used white acrylic paint to add a wash to the background. After the paint was dry I adhered everything down to the background paper. I added stitching around the tree, by the photo cluster and also by the house on the bottom right. I also added a sprinkling of enamel dots from My Mind’s Eye in coordinating colors. I wanted to add black splatters but the background paper has a slick feel to it and I was concerned that Black Color Shine wouldn’t soak into the paper. So instead of using Color Shine I mixed black acrylic paint and added splatters using a paintbrush. I’ve put together a process video that show how this layout came together. It also includes a Cricut Design Space tutorial showing you how I combined the cut files to create the tree on my layout. Remember today is the final day to take advantage of the sale that is happening at The Cut Shoppe. Be sure to check out all of the amazing cut files and stock up! I hope you all had a very Merry Christmas and a Happy New Year! Thanks for joining me today! YAY, Amie! So glad the tutorial helped you!! You will most definitely get the hang of the Explore! Just keep playing! Can’t wait to see what you create! !